This is the newest release from Maine Beer Company a robust porter. This is a 16.9oz bottle, same as the others from Maine Beer Company. This beer is dark with a nice thick tan head. Aroma has lots of chocolate and roasted malts and is very inviting. 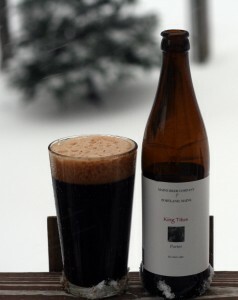 King Titus has a very smooth mouthfeel and light carbonation that makes it easy to drink. Taste has lots of chocolate and some coffee but that seems to take a back seat to the chocolate. Overall this is a great beer and even if you do not enjoy dark beers like stouts you should give this one a shot. Brewers Description: Our take on an American robust porter. Dark, thick, chewy, chocolaty, and of course, generously hopped.